It was a rare sight no photographer wanted to miss! 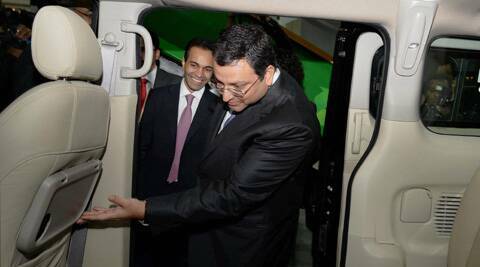 Tata Group Chairman Cyrus Mistry paying a visit to competitor Ashok Leyland’s stall at the 12th Auto Expo here. Dheeraj Hinduja, Chairman of Ashok Leyland, the flagship company of Hinduja Group, was seen explaining each and every detail of commercial vehicles on display at his stall to Mistry, who is Tata Motors Chairman as well. Scores of photographers were jostling with each other to click Mistry at Ashok Leyland stall. The Tata Group Chairman patiently surveyed all products on display and also took interest in understanding the specifications of individual models from Hinduja. Tata Motors sales in commercial vehicle segment declined by about 40 per cent to 25,683 units in January this year from 42,571 units in the same month last year. Ashok Leyland performed somewhat better by posting only 26 per cent decline in numbers. Sales declined to 7,847 units in January, 2014 as compared to 10,561 units in the same month of the previous year. Hinduja did not offer any comment Mistry’s visit to his stall. Later in the day, Tata Group Tata Group Chairman Emeritus Ratan Tata met Anand Mahindra, Chairman of Mahindra Group. The groups are rivals in both the utility and the commercial vehicle segments.